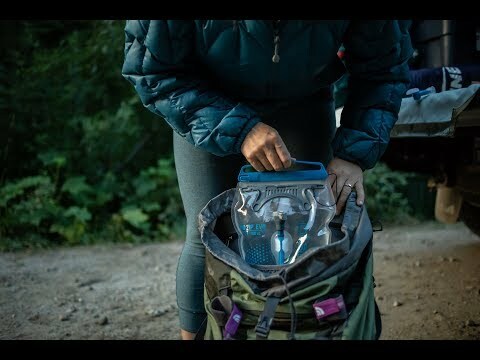 As the newest evolution in taste-free hydration, the Big Zip EVO delivers a significant 50% increase in flow rate from its predecessor, so you feel satisfied with less slurping. Makes a great option for backpackers, hikers and mountain bikers. The silver-ion in the materials keeps the reservoir fresh and bacteria-free. Secure zip-seal for easy opening, closing and filling. Pincher grip helps with one-handed filling. High-mount quick disconnect is easy to reach when the reservoir's in your pack. HyFlow bite valve improves flow. Shut-off valve is leak-proof and ideal for stowing. Easy to clean, thanks to the wide opening and rounded corners. Embedded silver-ion protects clean water from mold and bacteria. Semi-rigid baffle helps keep reservoir open to help it dry faster and with less fuss. All materials are certified food-grade, BPA-, BPS-, phthalate-free and taste-free, guaranteed. Internal baffles help reduce liquid sloshing.